I had to rediscover who I was. And that’s why I left the apartment. . . . And there I was, right in the heart of the Arab world, a world that never tired of making the same mistakes over and over. . . . I had no more leniency when it came to the Arab world. . . None for the Arabs and none for myself. I suddenly saw things with merciless lucidity. . . .
Salé, near Rabat. The mid 1980s. A lower-class teenager is running until he’s out of breath. He’s running after his dream, his dream to become a movie director. He’s running after the Egyptian movie star, Souad Hosni, who’s out there somewhere, miles away from this neighborhood–which is a place the teenager both loves and hates, the home at which he is not at home, an environment that will only allow him his identity through the cultural lens of shame and silence. Running is the only way he can stand up to the violence that is his Morocco. 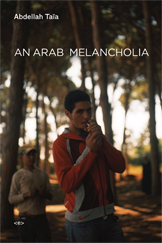 Irresistibly charming, angry, and wry, this autobiographical novel traces the emergence of Abdellah Taïa’s identity as an openly gay Arab man living between cultures. The book spans twenty years, moving from Salé, to Paris, to Cairo. Part incantation, part polemic, and part love letter, this extraordinary novel creates a new world where the self is effaced by desire and love, and writing is always an act of discovery. Abdellah Taïa (b. 1973) is the first openly gay autobiographical writer published in Morocco. Though Moroccan, he lives in Paris. He is the author of Mon Maroc and Le rouge du tarbouche, both translated into Dutch and Spanish, and Salvation Army (published by Semiotext(e) in English in 2009). He also appeared in Rémi Lange’s 2004 film Tarik el Hob (released in English as The Road to Love).